This blog will talk about what I liked about certain tools and how I found them useful. Watchthatpage.com is a really helpful site as it allows you to monitor sites that do not have RSS feeds or e-mail alerts. What Watchthatpage.com allows you to do is subscribe to a certain page and then you are emailed when a change to that page occurs. Therefore, static informational pages that are not updated as often as most websites, can be monitored in a organized way. Pipes is by far my favorite program but that might just be because I am also an engineer. 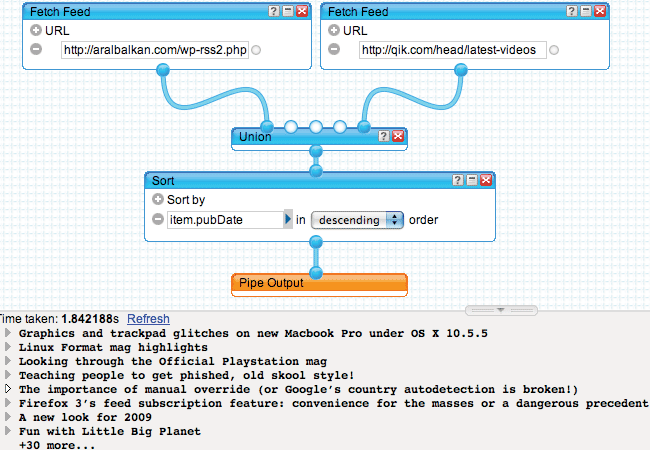 Pipes allows to basically program and filter your own RSS feed. Instead of having multiple and separate RSS feeds with irrelevant information, I can combine them and filter out the information that is irrelevant. Pipes is extremely addicting. After learning about it in class, I could not stop playing around with it. It really is the ultimate customization tool in RSS feeds. I highly recommend this tool for those looking for a way to create the ultimate RSS feed; however, if you are not technologically savvy or are not familiar with programming, this can be a difficult tool to learn to use. Once you choose all you have to do is select how often you want an alert and you are done! Google Alerts seems very simple but it is sometimes more useful than RSS Feeds and Page Monitors. If you have a blackberry or any mobile phone that receives email, it is much more convenient to receive these news updates as emails, as you can read them immediately. It is also a lot faster than reading RSS feeds on Google Reader or Bloglines. I really like Dapper!. Dapper is a fascinating tool as not only does it allow you to custimze an RSS feed but it has so many unique features to it. After collecting sample content pages, Dapper looks at these pages and understands their structure. Unlike other customizable RSS feeds, Dapper really focuses on create a content based RSS feed and allows you to structure it any way that you want. Dapper feels that it has the same power as Pipes but has a much better look to it. Use dapper to your advantage, I know I did. I created an RSS feed using Google to show me sports scores in a customized way. These tools are exceptional. I was very new to the idea of RSS feeds before this class and really did not know how to use them to my advantage. At first, I just began creating RSS feeds to anything interested me and reading them in my Google Reader but after learning about these tools I realized i can do so much more. By combining my programming knowledge and using Pipes, a new world was opened to me. The tools that are now at my disposal are unlimited. RSS feeds are soo COOL!